Highlands crafters are busy putting the finishing touches on their creations in anticipation of the third annual Highlands Arts & Crafts Faire plus Holiday Cookie Bar, set for Saturday, Dec. 2, from 10 a.m. to 4 p.m. in the Highlands Clubhouse. 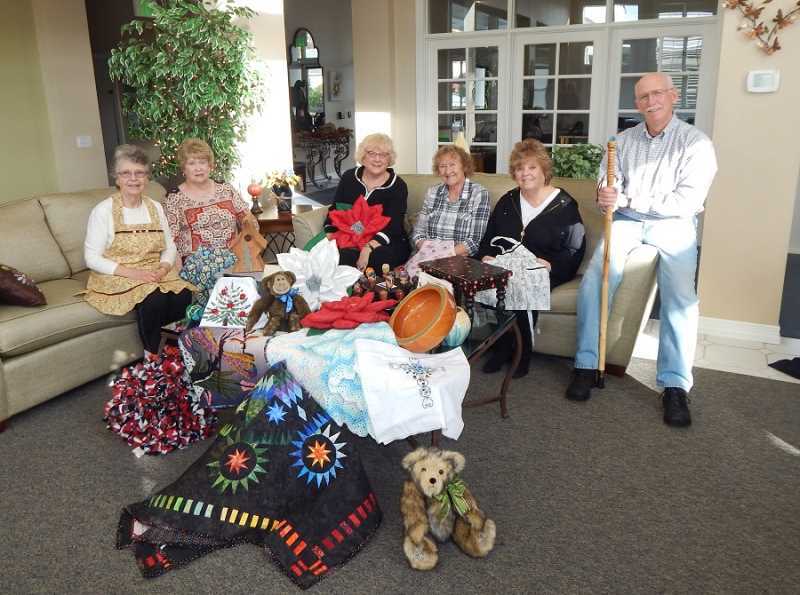 Several of the crafters gathered recently in the Clubhouse for a "show and tell" preview of some of the items that will be for sale. Donna Platt is a fantastic painter who hand-paints items in a tole style such as foot stools, rocking chairs and tiny kids' chairs. If that weren't enough, she crochets baby blankets, "handles" for dish towels and stocking caps for newborns, plus she makes jewelry. "And I made 60 jars of jam, including peach and strawberry-rhubarb, that I usually sell out of completely," she added. Nancy Crandell is well known for making her "Teddy bears and friends" as well as pillows and Christmas tree napkins. And this year she is offering an unusual pet item that dogs will go crazy over. She sews washable "snufflemats," which are strips of fabric turned into what looks like fluffy flowers in which pet owners hide tasty treats that dogs (and even cats) love to dig through to find every crumb. Bonnie Fletcher has quite a reputation far beyond King City for her beautiful Brazilian embroidery and quilting, which are really collectors' items, and many stunning pieces will be for sale. Kathy Bodyfelt sews amazing poinsettia fabric pillows with wrapped fringe in the centers. "I made a bunch years ago for gifts after adapting a pattern, and I decided to make them this year because they are so popular," she said. As for her unusual name, she explained that it was originally a long Dutch name, "and someone at Ellis Island had a sense of humor." Mark Nelson is a wood-turner and has been a popular vendor at the faire in the past. One of his unique creations is wine bottle stops, which are created using acrylic and wood burls. "I poor acrylic into a mold and attach it to part of a wood burl," he said. Nelson also makes beautiful wood bowls and had one on hand made out of African mahogany with inlaid turquoise around the rim. In addition, he makes bracelets, Christmas ornaments and vases with inserts. "The fun thing about woodwork is that you never know how it will turn out," he said. "Now I've started making walking sticks. When I started, I had no idea if people would like any of this, but I wanted to do something to keep me out of the rain in the winter. But I have found that I can't charge more than $1 an hour when I set prices or they are too expensive." Among the woods he uses are Hawaiian koa, chechen, Honduran mahogany and cocobola from Mexico. Donna Escriva makes such functional items as aprons for girls, boys and ladies plus fun pillowcases for kids, and she brought a few aprons to the gathering, which a couple of the ladies put on. Perhaps the most popular part of the faire is the Holiday Cookie Bar featuring delicious homemade goodies by Highlands residents. "People can eat some here and drink cider or take them for gifts or home consumption," Crandell said. "We don't charge for them, but people can make donations. The first year we made $200 and were hoping to match that again, but when we counted the money last year, we were stunned that we had raised $350 for the Oregon Food Bank. This year we are donating the money to the Good Neighbor Center in Tigard and the Bethlehem House of Bread in Metzger." The Highlands Clubhouse is located at 12930 S.W. Peachvale St., off 131st Avenue off Beef Bend Road.